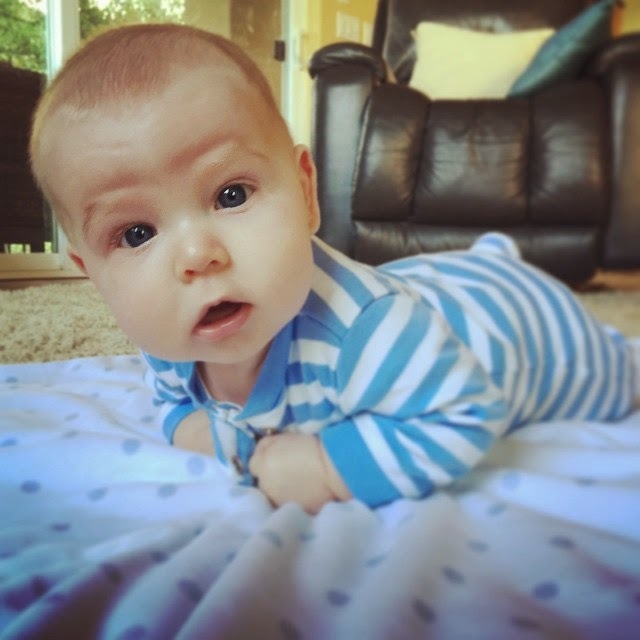 Then I Got To Thinking...: Dear Nolan... You're 4 months old! 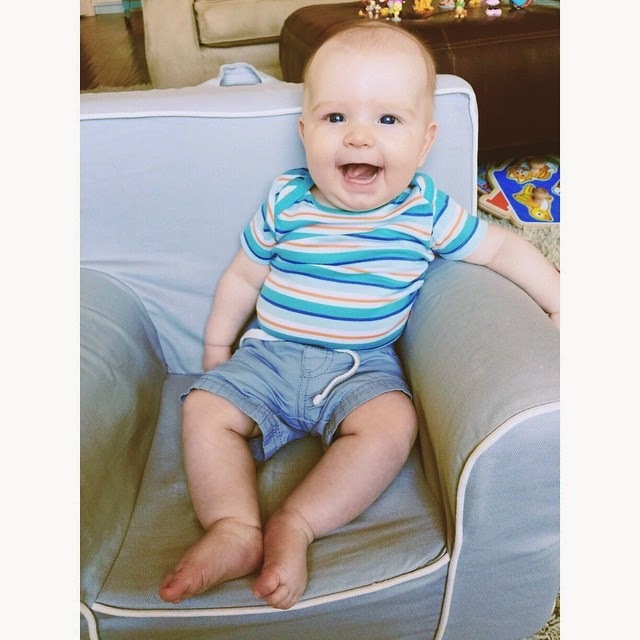 Dear Nolan... You're 4 months old! My mellow, smiley little guy. . . you are 4 months old! Every morning, I wake up and the first thing I do is turn to my right to stare at you. You always wake up with a big, happy smile and I am immediately filled with so much gratitude and joy to have you in my life. I hope you always wake up happy and ready to start another day. Our adventure with you has been so much fun this month. You started giggling!! The first time was for your pops (who affectionately calls you 'lil louie') and from there all we have to do is tickle you or tell you funny stories. You've really started developing more of your personality traits. 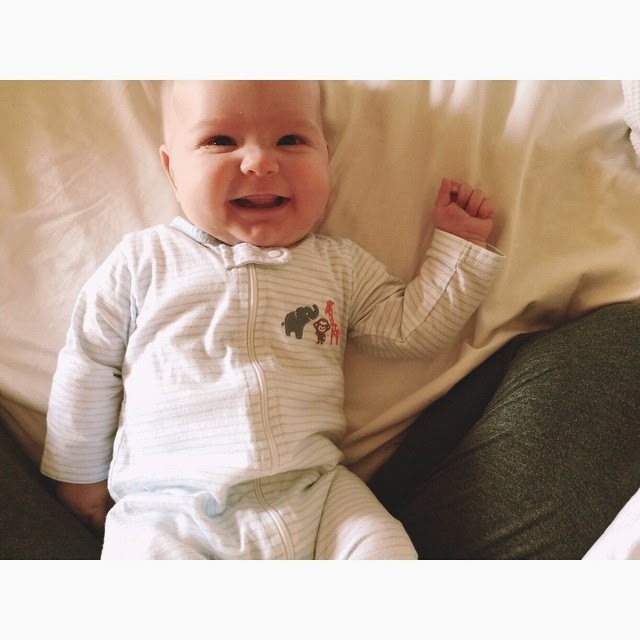 You've become pretty mellow and comfortable in your own little body - you're easy to entertain and love watching your big sister play around you. You've gotten really good at grabbing things and putting everything in your mouth!! You seem to especially like blankets and will chew on them when you figure out you have it in your hands. You had your first Easter this month and we went to Aunt Karen's house. You looked adorable in your little outfit and took a picture with several of your second cousins. We've done several play dates with a few babies your age, and it is so much fun to put you all together and take pictures. You seem to enjoy laying on your back and batting at toys. Your neck has gotten much stronger and you're able to hold your head up high and look forward. You have started rolling from your tummy to your back, but you don't always remember how to do it. This week you did it twice in a row, but sometimes you get stuck and need help. You still have a clogged tear duct and get lots of eye boogies from it, we are hoping that clears up soon. You are a very big boy. I am estimating that you weigh close to 16 pounds and you are wearing size 6 month clothes and filling them out. 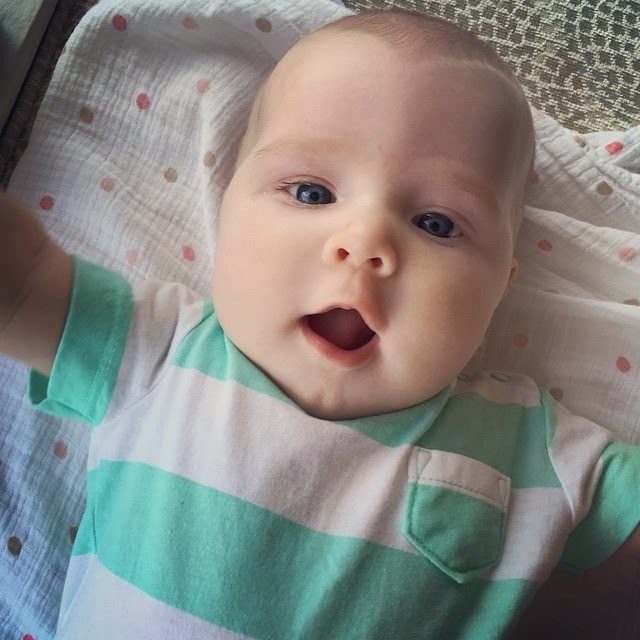 We are transitioning you to 9 month jammies this month because 6 month is just so tight! We are also transitioning you into size 3 diapers this week because you are managing to potty right out of the size 2. You haven't been the best sleeper. We are having a little bit of trouble getting you into a good routine. Right now you are waking up 2-3 times a night and sometimes it will take an hour to get you back to sleep. We will find our groove soon. The special time I have with you in the middle of the night won't last forever, so even if I am tired, I feel very blessed to be breastfeeding you. You are still eating very well - usually every 2-3 hours during the day. You do take a bottle of pumped milk well if I am not home. You have the most beautiful blue eyes and lots of people comment on your light brown hair. Occasionally it looks like it has a slight shade of red in it if you are in a certain light. You have the cutest little booty - cottage cheese buns and rolls galore in your thighs. I love seeing your naked little body during bath time. You are almost growing out of our infant tub... you love to kick and splash during bath time and water typically goes everywhere. Bath time is still one of your favorite times of the day, I think. You are talking a lot more - babbling at us and screaming with happiness, too. You are very vocal. You have the most adorable gummy smile. Sometimes while I am away from you if I think about that smile I feel immediately happy - it is just so electric and joyous. I can't possibly put into words the depth of this love I have for you, my son. You have really opened up a special place in my heart and I am just so grateful for you. You make me so proud. I am always a little sad to write these letters to you because I know time is passing at an impossible pace. I am doing everything I can to just savor this time. We spend a few minutes each day staring at each other and I hope you are feeling this love. 4 months old, baby boy!! You're growing, thriving, changing, and making me happy every single day. I love you so much.